Defending champion Rafael Nadal retired from his U.S. Open semifinal because of a painful right knee after dropping the opening two sets, putting Juan Martin del Potro back in a Grand Slam final for the first time since he won the 2009 title at Flushing Meadows. Del Potro was leading 7-6 (3), 6-2 after two hours of play Friday when Nadal shook his head and said he had to stop. "That was not a tennis match at the end. Just one player playing, the other staying on one side of the court," Nadal said. "I hate to retire, but staying one more set out there, playing like this, would be too much for me." The No. 1-seeded Nadal has a history of tendinitis in his knees and he said he felt a problem in the right one early in the first set. He was visited by a trainer at the changeover after the match's seventh game and tape was applied below the joint. After the third game of the second set, he had a medical timeout so the trainer could massage his right leg and once again apply tape. But Nadal's movement was clearly limited and by the end he was walking with a bit of a hitch in his gait between points. At one juncture, he approached the chair umpire to complain about a late call from a line judge and mentioned in passing that he was going to have to quit. Soon enough, he did just that. 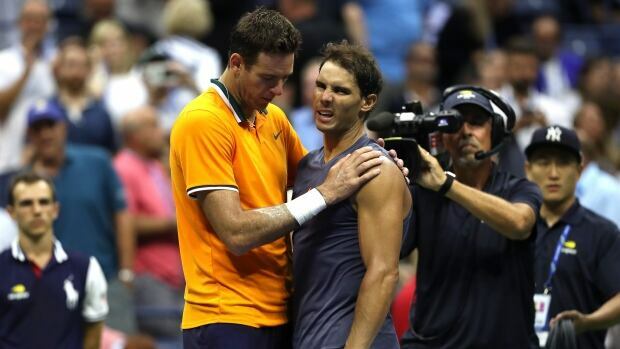 "Of course, it's not the best way to win a match," said del Potro, who hugged Nadal when it was over. "I don't like to see him suffering on court today. So I'm sad for him." For del Potro, it was an odd way to return to an important summit. Nine years ago, he stunned Nadal in the semifinals and Roger Federer in the final at the U.S. Open at age 20. He was considered a rising star at the time, but a series of wrist operations — one on his dominant right arm, and three on his left — slowed his career and kept him out of 2 1/2 years' worth of major tournaments. "It means a lot to me," del Potro said. "I didn't expect to get in another Grand Slam final." On Sunday, the powerful Argentine with the massive forehand that zips along at more than 100 mph (160 kph) will face two-time U.S. Open champion Novak Djokovic. Djokovic reached his eighth U.S. Open final by beating Kei Nishikori 6-3, 6-4, 6-2. Djokovic is bidding for his third title at Flushing Meadows and 14th Grand Slam trophy overall. The No. 6-seeded Djokovic missed last year's tournament with an injured right elbow. He will face Juan Martin del Potro in Sunday's final. Del Potro advanced when Rafael Nadal retired after the second set with a knee injury. Mike Bryan won his record-setting 18th Grand Slam doubles title and his second straight with Jack Sock, beating Lukasz Kubot and Marcelo Melo 6-3, 6-1. Bryan won his first 16 majors with twin brother Bob, who then was sidelined with a hip injury. So Mike paired with Sock and they won Wimbledon in just their second event together. Mike Bryan broke a tie for most major doubles titles with John Newcombe, and at 40 years, 4 months became the oldest Grand Slam doubles champion in the professional era. Six of his titles, also a record, have come at the U.S. Open. Bryan and Sock, seeded third, are the first team to win consecutive Grand Slam doubles titles since Mike and Bob won four in a row from 2012-13. They are the first pair to win Wimbledon and the U.S. Open in the same year since Jonas Bjorkman and Todd Woodbridge in 2003. Kubot and Melo, seeded seventh, were trying to win their second major together, having won Wimbledon in 2017. Canada's Leylah Fernandez's U.S. Open run ended in the girls' quarter-finals. The 15-year-old from Montreal lost 3-6, 6-3, 6-2 to No. 4 seed Maria Camila Osorio Serrano of Colombia on Friday. Osorio Serrano converted on four of seven break-point opportunities. Earlier Friday, Fernandez, the No. 8 seed, beat Taisya Pachkaleva of Russia 6-2, 7-6 (4) in the completion of a suspended third-round match. The big statistical difference was on second serve where Fernandez won 63 per cent of her points, as opposed to just 35 per cent for the unseeded Pachkaleva. Fernandez reached the semifinals of the French Open earlier this year.